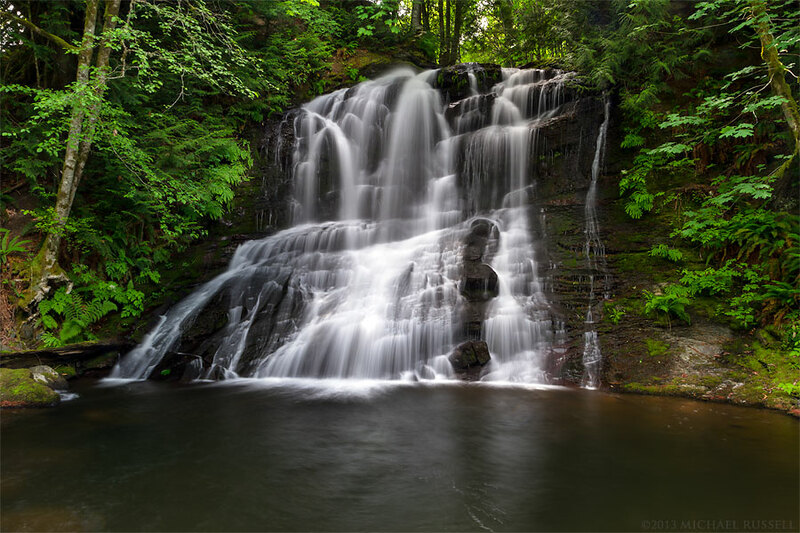 I had already walked around Colliery Dam Park in Nanaimo on two separate occasions before someone asked me if I had seen the waterfall. I had thought they meant the two spillway waterfalls from each of the two dams in the park, but apparently there was a natural waterfall just a minute or two walk from where I stood. I am rather fortunate that this was pointed out to me, as research of the area and my own exploration had failed to discover Chase River Falls. Another reason I feel I was fortunate to be pointed to these falls at that time is that Colliery Dam Park itself will largely cease to exist due to removal of the two small dams. This will create large holes where the two small lakes now sit. I do not know if access to the Chase River Falls will change, but either way, strolling through a nice forest next to a lake is certainly more picturesque when compared to a construction site or open pit. See more of my Waterfall Pictures.